I’m looking forward to Mono Mondays! Great story and why you like b/w shots! Keep up the good work on these, LOVE mono shots! Aside from the Mono nature though, I don’t think that’s what made this shot. Not even close. At first look, it was kinda sad to see. It had an emotional impact and that I think matters more than any technical thing you were going for. Not to downplay it, but in shots like this, that comes second. I love black and white photos! This was my dad’s prime area of interest and I think I got the love of this form from him. What a great capture Dave, really looking forward to more! Like Aaron said, this is a very emotional and power image. Great capture Dave! You did a great job emphasizing the most important focal point in the image by darkening the rest of the scene. 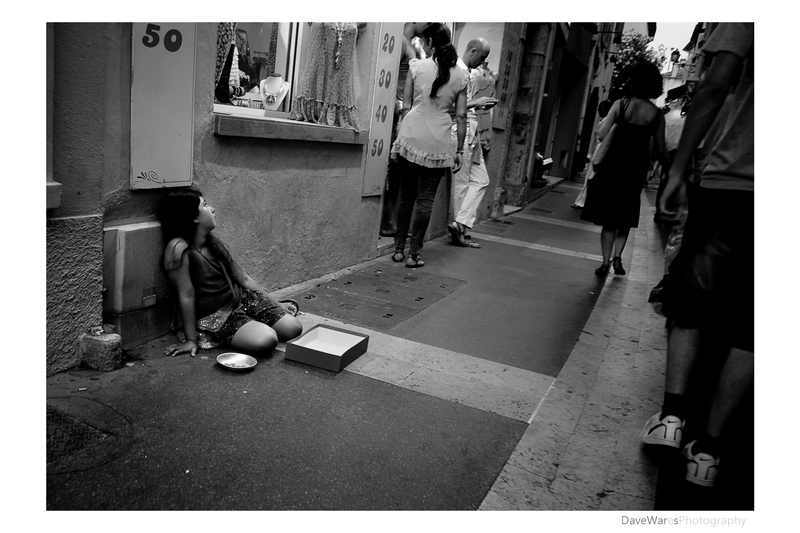 It emphasizes the girl begging, and the people who have just walked right past her without noticing. Love the emotion of this shot. You feel for the girl and what that must be like. Love the idea. Love the shot, too. Looking forward to more!